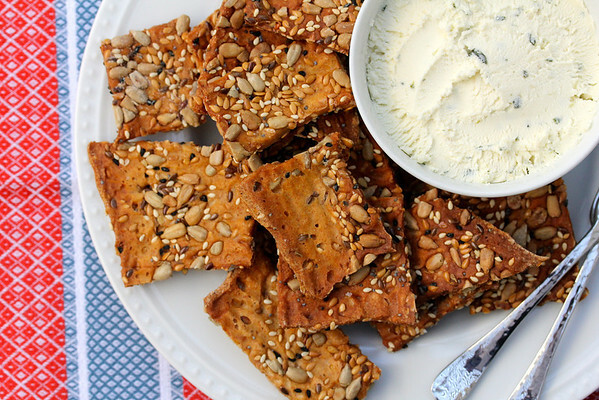 These crispy and crunchy seeded crackers forced me to skip dinner the other night (not dessert though). Why? Because I kept eating them. First, while they were in the oven to make sure they were crispy. Second, while they were cooling to make sure they were crispy. Third, once they were out of the oven, because I was already addicted and couldn't stop. This is my second time attempting these crackers. I was fortunate enough to be a part of the King Arthur Flour test group that tried this recipe and provided feedback. They had provided the testers with the cracker recipe as well as some golden and regular flax seeds. If I remember correctly, I had a really hard time getting them thin enough because the dough kept springing back. 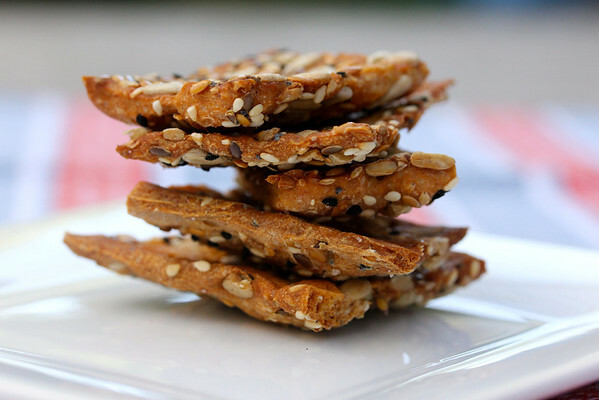 While I liked the golden flax seeds, I wasn't that thrilled with the crackers the first time I made them. While the seeds were tasty, the crackers were thick and tough. Now I wish I had saved the original recipe to compare because this time these crackers were simply amazing! This time I substituted some spelt flour (an ancient form of wheat) for some of the whole wheat. This might have helped because this dough did not require a lot of time to relax, and it rolled out nicely. Or maybe I'm just a better baker now. Regardless, here's to second tries! Why did I decide to make these crackers again you ask? Because I am baking along with the Bread Baking Babes as a Buddy of course. The Kitchen of the Month is Tanna's of My Kitchen in Half Cups. Visit her post to see links to all of the Babes, as well as all of the wonderful kitchen toys she was able to use to make these crackers. I have serious gadget envy. Mix the dough ingredients in the bowl of a stand mixer with a dough whisk. Knead the dough ingredients with the dough hook for five minutes. The dough should clear the walls of the bowl and be slightly tacky. Place the dough in an oiled bowl, cover, and let rise for 60 minutes. My dough almost tripled, but yours may not. Don't worry. Lightly flour a work surface and turn the dough out onto it. Divide it in half with a bench knife. 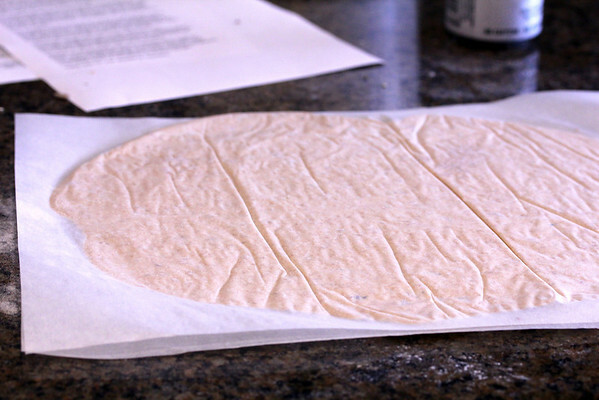 Place once piece of the dough onto a sheet of parchment paper and roll it out to a 9 inch by 14 inch rectangle. Lightly mist the top of the dough and sprinkle 1/4 C of the seeds on top of the dough. Cover it with another rectangle of parchment paper and press the seeds in with a rolling pin. Flip the dough over, parchment and all, peel off the (now) top piece of parchment. Mist the other side of the dough, sprinkle with 1/4 C of seeds, top with parchment, and press the seeds in with a rolling pin. Move the dough to a baking sheet and removed the top piece of parchment. Prick the dough with a fork all over and cut it into rectangles or squares, or whatever shape you like. Sprinkle the top with a tiny bit or sea salt. Cover lightly with plastic wrap. Allow the crackers to rise (very slightly) for 30 to 45 minutes and preheat the oven to 350 degrees F.
Bake the crackers for 20 to 25 minutes, until medium brown. You many need to switch the pans halfway through if your oven temperature varies from top to bottom. Turn the oven off and leave the crackers in the oven without opening the door for 15 minutes, then crack the oven door about two inches and allow them to cool in the oven. This will make sure they are crispy. When they are completely cool, remove them from the oven and store in an airtight container. You are so right, Karen: impossible to stop eating these delicious, crunchy crackers once you start. Congratulations for your "KAF Tester" title. How great must it be to be one of the first to try their recipes. Wow I am so thrilled that you were able to compare these two bakings! I think like you I'm really disappointed to not have the first recipe and extensive notes from that baking to compare ... trust me I'm sure I'd be exactly where you are without the original recipe let alone any notes. Spelt is a constant surprise to me, really liking what I've baked with it. Delighted to have you bake with us ... second tries are worth while! After I made these crackers, I tried using it in bread and was really pleased. How fun that you were among the first testers! They look beautiful...and I agree, they are addictive! It was definitely fun and I felt really lucky! Bet you are a better baker now, plus using the spelt surely helped and bet it helped the flavor, too. They look awesome...crisp, golden and seedy. Thank you Elle, I am definitely better with yeasted doughs. After these crackers, I tried it in bread and loved it. Here's to second chances! How cool is it that the crackers were so much better this time round? They look great! I love how they are a little curved rather than flat. And what kind of herbed spread is that in the photo? These sound delicious and healthy, too! I've never made homemade crackers before but I'm thinking now I should! Thanks for sharing on Saturday Night Fever! Pinning this now! See you again this week! 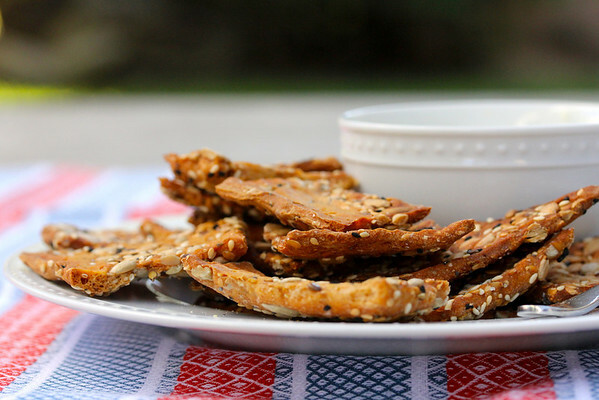 I love a good crunchy cracker, and I would have to 'taste test' often too ;) thanks for sharing the recipe - will be trying soon! These crackers look so adorable. I've never tried spelt flour but I've been following Maria Speck and her work on ancient grains makes me think it would be wonderful to try. Also love your story of how you got to your "final" - the trials and errors are often tough while you're cooking/baking but also so necessary.